THE BRITISH RAILWAY STORIES LTD: "Tale of the Unnamed Engine - Reviews"
"Tale of the Unnamed Engine - Reviews"
So far, it's a 100% score on Amazon.com and Amazon.co.uk - 5 star reviews everywhere! Here's a sample of my favourite reviews. "A remarkable piece of work by an author new to the scene. S.A.C Martin clearly lives and breathes his subject matter and this fact shows immensely in this book. He has managed to capture the essence of both the modern day preservation movement and the heydays of steam in this and his popular Youtube series[...]. Accompanying the remarkable storytelling is the atmospheric and colourful artwork of Dean Walker, another member of the railway fraternity and an accompished artist". "The first of what will hopefully develop into a long and prosperous series, 'Tale of The Unnamed Engine' could so easily be dismissed at first glance as being 'another book about talking trains'. Where this differs greatly from other well-known, established character series is the amount of factual content almost seamlessly woven into both text and illustrations alike". "You won't find any of your garishly coloured, made-up engines doing silly things here, and you won't find a story that sets out to insult the intelligence of kids, or bore adults who are asked to read them over and over again". "Instead, the reader is taken on a journey back to a lost but fondly remembered age. It sets out not just to entertain but also inform, and achieves this incredibly tricky balancing act with considerable style and apparent ease. The mix of engaging story (featuring strong and well-defined characters), laced with clear and concise explanations and descriptions of historical points of interest, accompanied by a breath-taking range of fresh, colourful and wonderfully atmospheric artwork make this a joy to behold". "Well, what can I say about this book. I am been waiting in anticipation for this book for some time, and I speak not only as a customer, but as a follower of Simon Martin's work for some years now". "The book itself is a fantastic read, even to adults. Yes its target audience is children, but its a fantastic return to the golden age of Children's literature before the days of over protective parents and crazed health and safety fanatics. Many younger fans of series like Thomas the tank engine actually have no idea of what a steam locomotive is, or how it even works, and in some circumstances the show has been criticised for apparently being politically incorrect and apparently scaring people into believing that all trains are going to crash and burn every 30 seconds". "Simon's work has shown just what children's literature should be like. Interesting, Informative, absoloutley smashing illustrations and with a great story line. It is especially apparent how much enthusiasm that both Simon and Dean have for the subject of Railways, which really has shown in the quality of work they have produced together. (Dean Walker being responsible for the fantastic illustrations in the book). When I was a child and growing up, I always found the subject of railways to be fascinating and the original Thomas story's did much to enforce that interest. The more recent renditions of Thomas have been a considerable let down, and quite frankly an insult to the work of the Reverend W Awdry, however that is my own personal opinion".
" If your child is interested in locomotives and railways, but is growing too old for the likes of Thomas the Tank Engine, then this is a definite must buy for you. A book six years in the making, and with all the effort that has been put into the publication, it's been well worth the wait". "The story is excellent, with brilliant structure and a choice of vocabulary that clearly shows that the author knows his subject fantastically well. Don't know what some of the terms mean? No worries, there is a glossary at the end, which shows that the author knows that a wide range of people will read this. Some will be railway enthusiasts, some may want to be one". 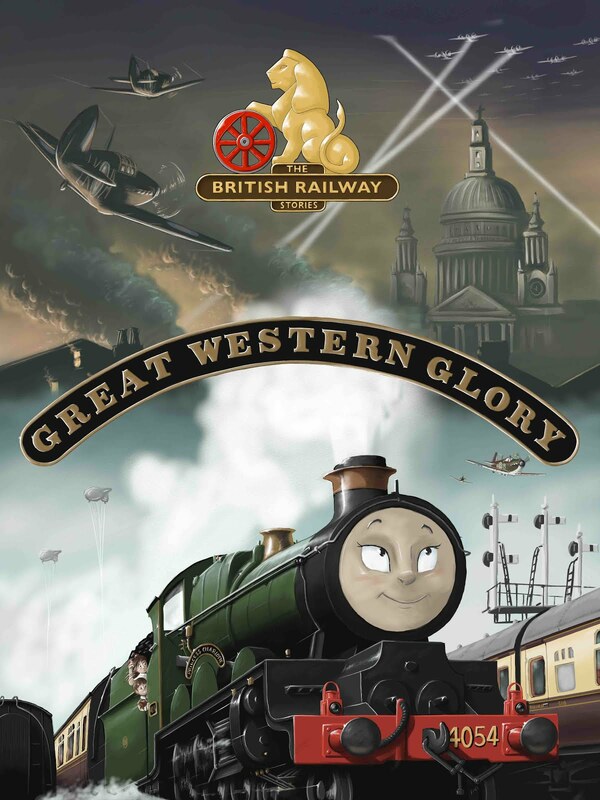 "After the story, there are fantastic fact files on the characters and locations focused on in the story, with some historical information on the locomotive classes that the characters are based on". "I've followed Simon's journey as a fan, from the first episode of the web series on YouTube up to this point, and it's great to see how far he's come". "I cannot finish the review without mentioning the breathtaking illustrations from Dean Walker. A very talented man, producing absolutely stunning illustrations of each engine, person, location, coach and truck. They say pictures tell a thousand words and they definitely do in this book". And of course, how can we not put up the stories' most ardent supporter and his views? Which in my opinion, absolutely nail what I was thinking when I was writing this story originally, all the way back in 2006! "I've been a friend of the creator since 2008 and have been an ardent supporter and fan of what he's been trying to build up over the last few years. The culmination of his work in this work is a testament to his commitment to his product and his passion for his characters and subject matter". "You're not in for a roller-coaster ride of a book, you're going to be taken for a gentle stroll where you get to admire every little fine detail as you go, and with traditional illustrations of outstanding quality and mesmerising colour, you're going to enjoy and appreciate every second of it fully". Until next time, thanks for all of your support thus far. I like the book a lot, but for some reason, one of my friends, Stephanie, has a hard time understanding the book: I tried telling her but it's hard to understand for her. What should I explain to her? Actually, she didn't read it: she just wanted to know what it was about, and I tried to explain to her, but confused her: since all the engines in the book are real engines, she thought that any real engine could talk since the engines in the book were real engines, which isn't true. But more details will be emailed to you. 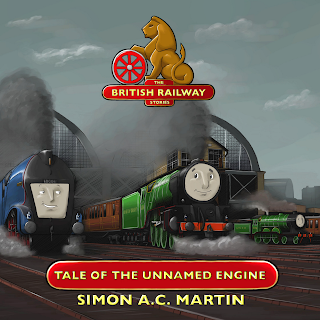 "Spread the word on...Tale of the Unnamed Engine"
"Tale of the Unnamed Engine - ON SALE"
"The YouTube Channel - Refreshed!" "The British Railway Stories Ltd"
"The British Railway Stories goes Live Steam!"